Location: Victoria Park, Stafford; on Station Road, opposite the train station. 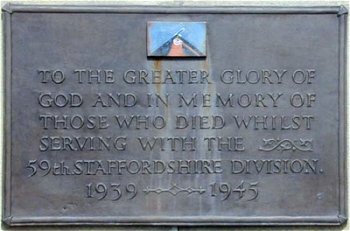 "To the greater glory of God and in memory of those who died whilst serving with the 59th Staffordshire Division. 1939-1945." 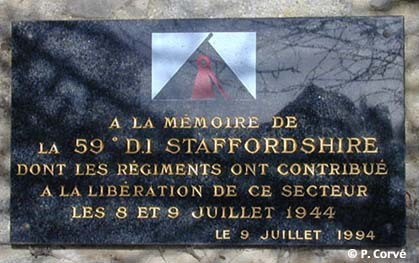 There is a smaller plaque underneath which says: "This plaque is a duplicate of that erected on the battlefield at Thury-Harcourt in Normandy." The cemetery at Cambes-en-Plaine, just north of Caen, is the final resting place for 224 soldiers belonging mainly to the South Staffordshire and North Staffordshire battalions which fought in Operation Charnwood, 8-9 July 1944. Fontenay le Pesnel cemetery holds the remains of 457 British soldiers, mainly from the South Staffordshire Regiment, East Lancashire Regiment, Royal Warwickshire Regiment. Lieut. 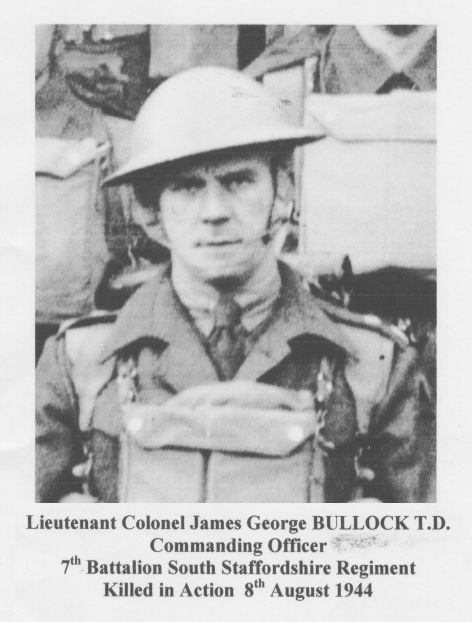 Col. J. G. Bullock (commanding officer, 7 S Staffs) is buried here  KIA 8 Aug 1944 (age 37) during the fight at the Orne River bridgehead. The fifty-nine German graves are largely soldiers from the 12th SS Panzer Division (HJ). Thanks to Allan Macintyre for contributing this photo and others (2014). Commemorates soldiers killed in Normandy whose grave locations are unknown. 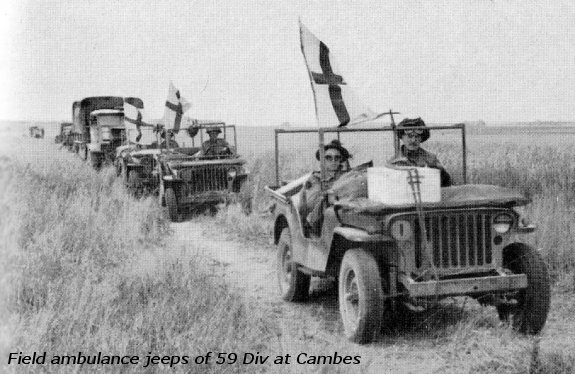 Has inscriptions in remembrance of 59 Division members who died during August 1944, including Operation Pomegranate and the Orne River crossing.